A roofer replaces the roof on a townhome after it was damaged by Hurricane Michael on October 16, 2018 in Mexico Beach, Florida. The neighborhood, which had homes most of the way to the beach before the storm, is now mostly flattened. 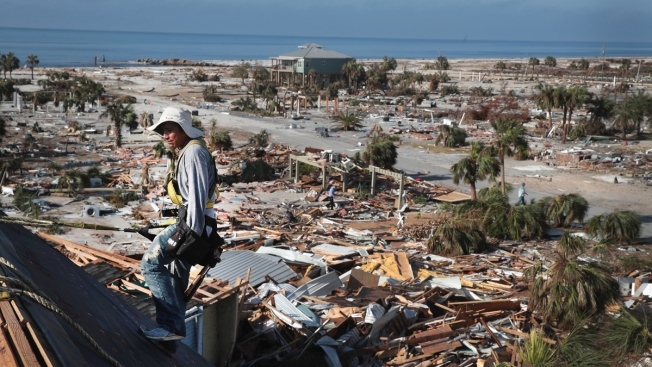 Hurricane Michael slammed into the Florida Panhandle on October 10, as a category 4 storm, claiming at least 19 lives and causing massive damage. Hurricane Michael's deadly storm surge unearthed shipwrecks caused by another hurricane — in 1899. The Tallahassee Democrat reports it's unclear which of the 15 ships, or how many, that grounded on the Franklin County barrier island during the storm 119 years ago were exposed by Michael. Facing the Gulf of Mexico, the wooden ships now rest in plain view near the west end of the island. State officials say resources are being used for more urgent hurricane recovery efforts, and there are no plans for state archaeologists to visit the site. The 1899 hurricane crossed over the Florida Keys into the Gulf of Mexico where it strengthened into what would be classified today as a Category 2 storm.